photos from the Aug 28 40th anniversary Chicano Moratorium march and protest in east L.A.
up to 3,000 people marched in the 40th anniversary CHICANO MORATORIUM march in east L.A. on Aug 28 2010. the marchers had as main demands… Stop the wars in Iraq and Afghanistan! Money for jobs and not for war! 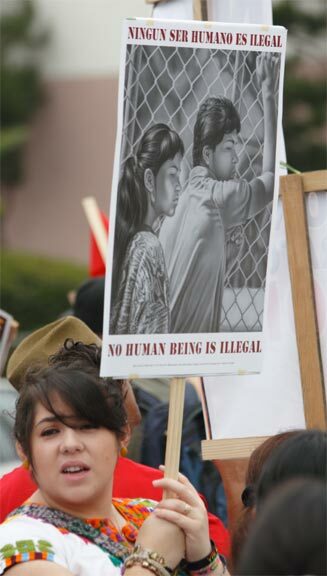 in this pic someone carries the poster \'No human being is illegal\" by Mark Vallen… there were lots of these given away in the march. 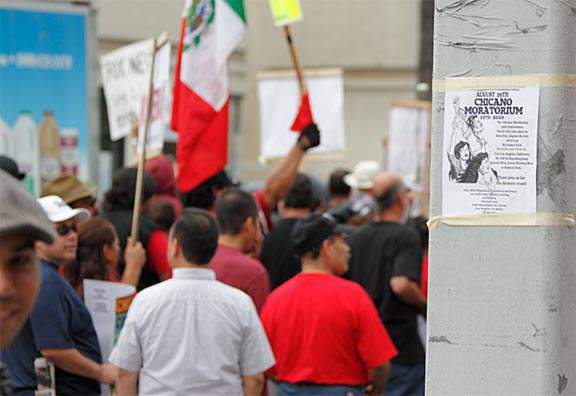 flyers calling for the protest were up all along Whittier boulevard where a big part of the march happened. lots of businesses and shops had moratorium flyers posted in the windows to show support for the protest march. lots of Brown Beret members came from all over to provide security and support for the marchers. 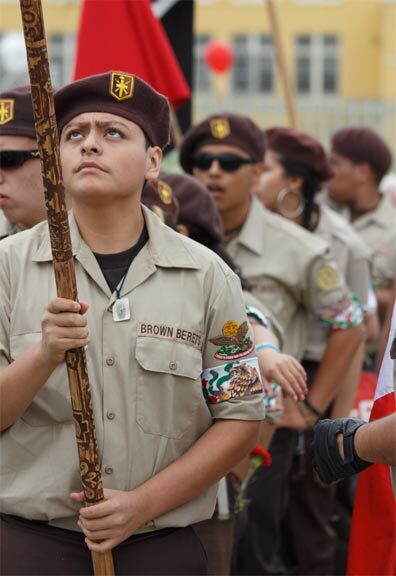 they came from Texas, Arizona, Nevada, and parts of California… must have been a hundred Brown Berets there! 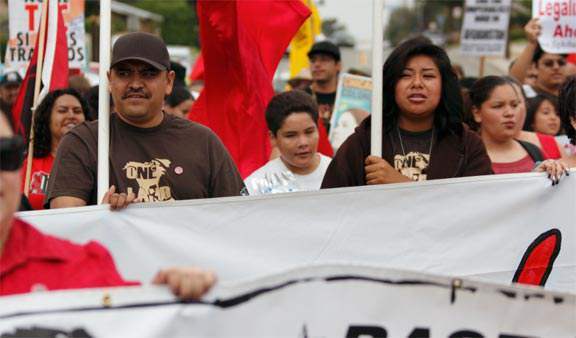 thousands march down Whittier boulevard to Ruben Salazar park for the final rally. 40 years ago the LA sheriffs attacked the protest in the park…. opened fire on the protest with 12 gauge shotguns… killing three activists including a young Brown Beret. Later that day they shot and killed Ruben Salazar a LA Times reporter, as he sat in the Silver Dollar cafe. the sheriffs shot Salazar with a tear gas gun canister , hitting him in the head. 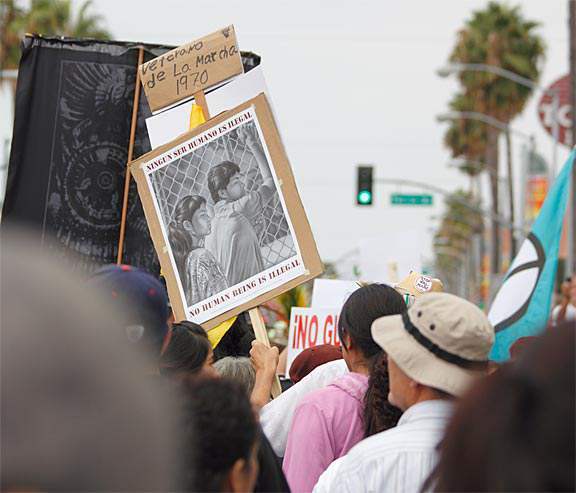 at this years march people placed heaps of flowers on the sidewalk on Whittier where the Silver Dollar used to be, and every body stopped along the march to pay respects the the reporter assassinated by the sheriffs department.